So this post is for my chunky monkey doodlebug #5...who is a whopping 7 months and 22 pounds! I think he is trying for a tie in the weight contest as the Chief was 30 pounds at 10 months....he is on his merry eating way! He is crawling and pulling up in his crib now. He is talking and already looked right at the Chief directly and uttered those words...DA-DA! Doodlebug #1 and #2 are working on his clapping abilities on demand. He just about has it. We are a "wrestling match friday night" kind of family and Doodlebug #5 attended his first match last week...getting right into the mix of EVERYTHING and loved every minite of it! I hope you enjoy Grant's happenings, he is a complete joy and a blessing to our family. You can totally tell he was in a fit of laughter! Just a day in the life of living with a 4 year old sister! Doodlebug #1 has officially left the 2nd grade and is now an official 3rd grader....boo...sob...sniff. :-(. Yes it's true, my little girl is truly growing up! I have spoken before about Doodlebug #1 being VERY imaginative and creative...well, her creativity has blossomed into fashion. Now, for me this is very difficult and had to be approached delicately. You see I PRIDE myself on the Doodlebugs appearances...nothing other than having them be presentable and hair done...oh yeah and I have this thing (it's a little thing) but I LOVE them to match! OK I am a little compulsive about it...there I said it...happy? Loving these little things I am. I think they are a great, crafty invention. Grant loves them and the Doodlebug girls and Gunner wear them on their arms. I love them and plan on ordering more! Plus, just how much cuter can Doodlebug #5 get anyway! Why is there school after CRCT? CRCT is my states 'passing" or "not passing" test that is administered about four weeks before Summer vacation. Here is the deal though. After the stress of studying, taking, and passing the test...school ends. Just like that...it's like the pressure is off and school is over. 'Cept it's not. We have four more weeks after the test. Doodlebug #1 has watched movies at school since last week. I think the cafeterias is "cleaning" out it's cub boards for the Summer 'cause Doodlebug #1 and #2 say the school served pizza AND chicken...INTHESAMEDAY, as an entree'....eeewwwww gggrrrooosssss! Well, it was bliss waking up to my Doodlebugs shouting "Happy Mother's Day" at the top of thier little Doodlebug lungs. I was actually thinking that other then getting a lovely gift, my Mother's Day consisted of the DB's piling into bed with me and snuggling, heading to church, out for a nice lunch, home for a nap, softball with the Chief, and ice cream cones...that's my day nearly everyday. This led me to realize the Chief and Doodlebugs do a pretty nice job of making EVERY day Mother's Day for me. I love them and treasure them will all that is within me. They are ALL my favorites! My friend Kim over at Living in Leesburg has won the Miracle Blanket. So Kim, thank you for your entry, and yes, it looks like PMS to me too. (hem, been there done that). So shoot me over an e-mail with your address and go to the Miracle Blanket site and pick out the color you would like and let me know. Thank you all so much for making my first give a way...so much stinkin' fun. Have a great day! Name This Photo For A Free Miracle Blanket! I can barely upload this photo with out going into a pants peeing hissy fit of freaking' laughter! So after many hours of "cleverly thinking"...I got nothing. So I decided to just copy, steal, mimic (what's that they say about imitation?) MckMama's famous "Name That Photo" and host a "Name That Photo" contest myself. So here it is. 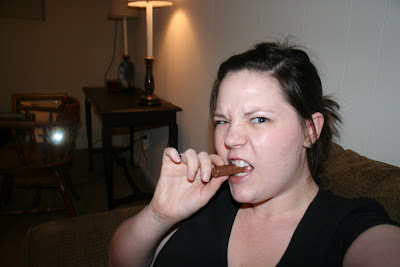 Give this photo of my BFF (she the one that makes the Doodlebugs delicious outfits) partaking in this mini Twix, a clever caption. Submit it to the site and we will choose a winner on Sunday! You will be winning a Miracle Blanket in the color of your choice. Mom's everywhere have sworn by this wrapping blanket to calm a baby in seconds. If by chance a blogger post about my contest and you happen upon Mrs. Chief through their blog, you can then tell me which blog linked me to you, and that said blogger will also win a gift from me as well. So put those thinking caps on and give me a great big chuckle. I can't wait to see what you may come up with! Miracle Blanket Give-A-Way And More! OK...so the good people from the Miracle Blanket company have contacted me and offered me a brand new Miracle Blanket. Because I was busy authenticating the e-mail from the Miracle Blanket people through MckMama , Doodlebug #5 is now too big to use it. Good news for you, and good news from MckMama, the e-mail was "for real"! I just ended a conversation with Susan from Miracle Blanket and told her I would just host a giveaway instead! So one lucky winner will be receiving a Miracle Blanket in the color of their choice. Yippie! I am going to spend the day thinking of some clever way to host my first give-a-way. So here's the deal. 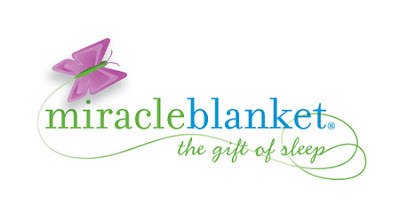 Please help me get the word out that a Miracle Blanket give-a-way is in the works. Please link my giveaway from your blog. When the winner is picked, if that winner will share with me who's blog she heard about the contest through (if there is one) that blogger will also win a gift from me as well, for helping spread the word. OK so I am off to "think cleverly".....I am so excited! And for those of you who read my blog and don't follow me...now is a great time to start!!! !